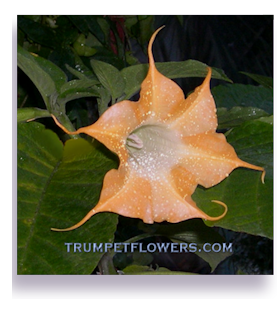 I plan on adding to this gallery as I continue to pollinate my brugmansia. 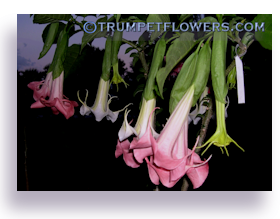 This is a cross pod of Joli angel trumpet as the mother plant, with Fleming Island Rachel as the donor. The pod is about 3 weeks old, and started around the first of December, 2012. Photo taken on December 21st, 2012. It is firm to the touch and furry, soft. 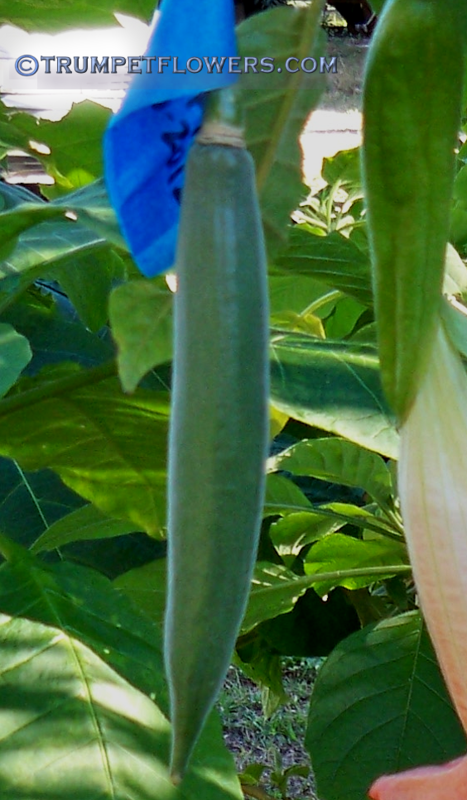 This is also another pod on the mother plant Joli, crossed with Fleming Island Rachel. I set the tape measure to it to show it&apos;s increasing size, now up to 8 and a half inches. 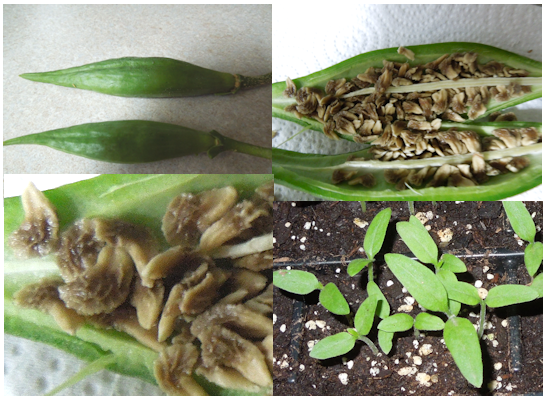 Photo taken on January 16th, 2013, making the seed pod exactly 2 months old. 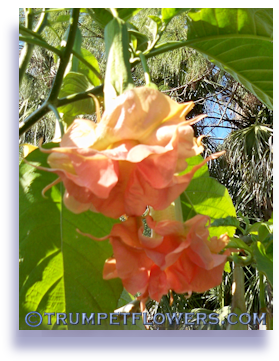 The blooming brugmansia in the background is Balao. Here is a set of photos taken by Marisel Addison. 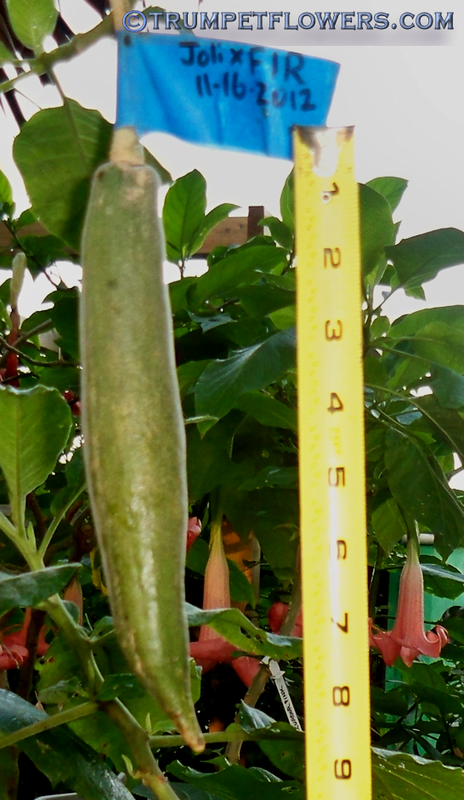 Marisel is showing us that her green Angel Trumpet Seed pod that was only half ripe, did in fact produce viable seed. Note how the seeds are half whie and half brown. She planted them anyway, and they did in fact sprout! Pink Catalonia in early April, with an unknown (bee pollinated) seedpod on her. 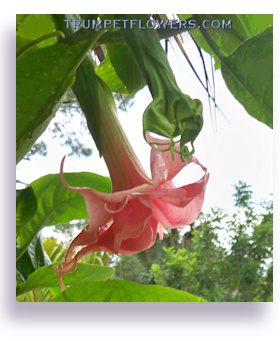 Seed pods on brugmansia that were pollinated in Spring can sometimes take over a year to ripen. On the other hand, Fall pollinations, that are protected from frost, can sometimes be ripe by the following Spring. Ripe seed pods will turn brown in most cases, and dry. But other times, they become yellowish and mushy. Never pick a firm, green seed pod if you are looking for ripe seeds to try and grow out yourself. Rather, test the pod when you feel it has some give, is truning colors, and has brown blotches or such on it. 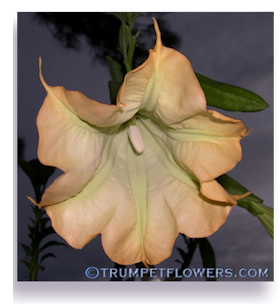 This can be done by taking an exacto knife and making a thin, perhaps 3 inch long slit in the side, going the length of the angel trumpet seed pod. Pull it apart just slightlly, and peer inside. If the seeds are green or white, the pod is not ripe. If they are yellowish, they are ripening, but not quite. If they are brown and corky, they are ripe and you can cut the pod off. To close an unripe pod, you can use superglue if the area is not too wet, or melted unscented candle wax. 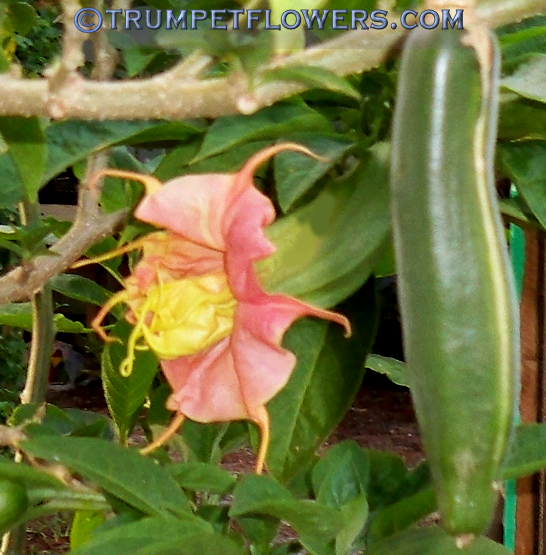 Ripe Brugmansia seed pods also usually display a brown, dying pedicel. 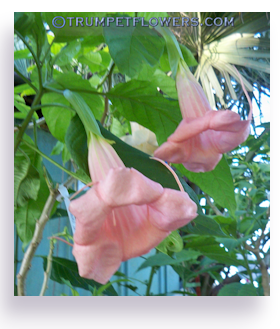 This entry was posted on December 18th, 2012 and is filed under Brugmansia Gallery.